The primary treatment for kidney cancer that has not spread to other parts of the body, which is a Stage I, II, or III tumor, is surgical removal of the diseased kidney (nephrectomy). Because most cancers affect only one kidney, the patient can function well with the remaining one. Two types of surgical procedure are used. Radical nephrectomy removes the entire kidney and the surrounding tissue. Sometimes, the lymph nodes surrounding the kidney are also removed. Partial nephrectomy removes only part of the kidney along with the tumor. This procedure is used either when the tumor is very small or when it is not practical to remove the entire kidney. It is not practical to remove a kidney when the patient has only one kidney or when both kidneys have tumors. There is a small (5%) chance of missing some of the cancer. Nephrectomy can also be useful for Stage IV cancers, but alternative surgical procedures such as transarterial angioinfarction may be used. Treatment of kidney cancer with anticancer drugs (chemotherapy) has not produced good results. However, new drugs and new combinations of drugs continue to be tested in clinical trials. One new drug, semaxanib (SU5416), is reported to have good results in treating patients with kidney cancer. As of 2004, however, semaxanib is still undergoing clinical trials in the United States. Bone scan — An x-ray study in which patients are given an intravenous injection of a small amount of a radioactive material that travels in the blood. When it reaches the bones, it can be detected by x ray to make a picture of their internal structure. Chemotherapy — Treatment with anticancer drugs. Computed tomography (CT) scan — A medical procedure in which a series of x-ray images are made and put together by a computer to form detailed pictures of areas inside the body. Cryoablation — A technique for removing tissue by destroying it with extreme cold. Immunotherapy — Treatment of cancer by stimulating the body's immune defense system. Intravenous pyelogram (IVP) — A procedure in which a dye is injected into a vein in the arm. The dye travels through the body and concentrates in the urine to be discharged. It outlines the kidneys, ureters, and the urinary bladder. An x-ray image is then made and any abnormalities of the urinary tract are revealed. Nephrectomy — A medical procedure in which the kidney is surgically removed. Radiation therapy — Treatment with high-energy radiation from x-ray machines, cobalt, radium, or other sources. American Cancer Society. 1599 Clifton Road, N.E., Atlanta, GA 30329. (800) 227-2345. http://www.cancer.org. Cancer Research Institute (National Headquarters). 681 Fifth Avenue, New York, NY 10022. (800) 992-2623. http://www.cancerresearch.org. National Kidney Foundation. 30 East 33rd Street, New York, NY 10016. (800) 622-9010. http://www.kidney.org. a malignant neoplasm of the renal parenchyma or renal pelvis. Factors associated with an increased incidence of disease are exposure to aromatic hydrocarbons or tobacco smoke. A long asymptomatic period may precede the onset of the characteristic symptoms, which include hematuria, flank pain, fever, and a palpable mass. Diagnostic measures include urinalysis, excretory urography, nephrotomography, ultrasonography, renal arteriography, and microscopic and cytological studies of cells from the renal pelvis. Adenocarcinoma of the renal parenchyma accounts for 80% of kidney tumors, occurring twice as frequently in men as in women; transitional cell or squamous cell carcinomas in the renal pelvis account for approximately 15% and are equally frequent in both men and women. Radical nephrectomy with lymph node dissection is usually recommended for tumors of the parenchyma. Nephroureterectomy is usually recommended for operable tumors of the renal pelvis. Radiotherapy may be used before or after surgery and as palliation for inoperable tumors. Chemotherapeutic agents may induce temporary remission. See also renal cell carcinoma, Wilms' tumor. Kidney cancer is rare, accounting for about 3% of all adult cancers. Kidney cancers are classified by cell type. The three most commonly seen in adults are renal cell carcinoma, transitional cell carcinoma, and sarcoma. Renal cell carcinoma arises in the renal tubules and accounts for more than 90% of kidney cancers. The other types of kidney cancer, transitional cell carcinoma and sarcomas, make up the remaining 10%. Most kidney cancers occur in one kidney only (unilateral) and are large and nodular. Renal metastases from other sites are unusual. Renal cell tumors usually grow as a single mass; however, several tumors can form in one kidney. Because even large tumors may not cause pain, often the tumor is found only after it has become significant in size. 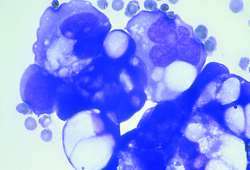 Most are found before metastasis occurs. There are five main types of renal cell carcinoma, all diagnosed by microscopic examination: clear cell, pupillary, chromophobe, collecting duct, and unclassified. Renal cell cancer is also graded on a scale of 1 (have a cell nuclei that is very similar to a normal kidney cell nuclei) to 4 (have a cell nuclei that looks very different from a normal kidney cell nuclei). Staging is a far better predictor of prognosis than grading. In 2013, statistics from the American Cancer Society reported that there were 65,150 Americans diagnosed with kidney cancer. The 5-year survival rate is as high as 90% if the cancer is confined to the kidneys and as low as 9% if metastasis has occurred. Complications from kidney cancer include renal hemorrhage and metastases to the lungs, central nervous system, and gastrointestinal tract. If it is left untreated, kidney cancer causes death. Although the exact cause remains unknown, several factors seem to predispose a person to kidney cancer. Smokers increase their risk of developing kidney cancer by 40%. A link also exists between kidney cancer and occupational exposure to cadmium (found in batteries), asbestos, some herbicides, benzene, and organic solvents, particularly trichloroethylene. Family history, obesity, and sedentary lifestyles are also risk factors for developing renal cell cancer. Mutations in several genes can lead to kidney cancer as part of genetic syndromes, including von Hippel-Lindau (VHL). Renal cell carcinoma is a leading cause of mortality in VHL and occurs in about 25% to 40% of affected persons. About 80% of VHL is transmitted in an autosomal dominant pattern; the remaining 20% is due to new mutations. There is a hereditary form of papillary renal cell carcinoma associated with mutations in several genes, and there are also a few documented cases of familial renal cell carcinoma. Kidney cancer occurs twice as frequently in men (who are more likely to be smokers and exposed to cancer-causing chemicals in the workplace) than women, commonly after age 40 with a peak incidence between the ages of 50 and 70. Children and infants diagnosed with kidney cancer usually have Wilms’ tumors or a tumor of the renal pelvis and, with prompt treatment, usually have a good prognosis. It is more common in North Americans with European ancestry as compared to people with African or Asian ancestors. The global incidence of kidney cancer is approximately 4 per 100,000 males per year and 3 per 100,000 females per year, but it varies by region. Males may have higher rates because of higher rates of tobacco use. People living in developed countries have an incidence approximately eight times higher than those in developing countries. 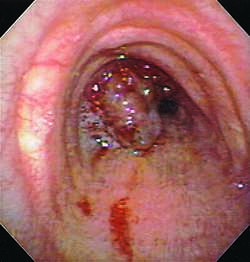 Question the patient about the classic triad of symptoms: hematuria, pain, and an abdominal mass. The most common single symptom is painless hematuria, whereas an abdominal mass is usually a late finding. The patient may also report vague signs and symptoms, such as a dull aching pain in the flank area. One-third of all patients diagnosed have these symptoms. One-third of patients have no symptoms at all, and the diagnosis is made during a routine physical examination. The other third of patients are diagnosed after the cancer has produced symptoms related to distant metastases. It is not unusual for the patient to have a normal physical examination. Occasionally, the patient appears weak, with an unintentional weight loss since the last examination. The patient may have hypertension, edema, or persistent fever unrelated to cold or flu. The placement of the kidneys, deep within the abdomen and protected by layers of fat, makes palpation of renal masses difficult. On occasion, palpation may reveal a smooth, firm abdominal mass. The patient may be preparing to retire or be retired when the diagnosis is made. Consider the patient’s and significant others’ ability to cope with a life-threatening illness at this life stage. The diagnosis may be met with anger. The patient diagnosed with late kidney cancer is facing a possibly terminal diagnosis. Assess support systems and consider making appropriate referrals if needed. Other Tests: Magnetic resonance imaging, arteriography, blood urea nitrogen, creatinine, urinalysis, and intravenous pyelogram (IVP). To determine if metastasis has occurred: bone scan, chest x-ray, positron emission tomography scan. Depending on the stage, surgical intervention and further staging is the primary treatment for renal cell cancer. In the early stages, some experts are considering molecular approaches such as sunitinib or sorafenib as adjuvant therapy. A radical nephrectomy (removing the whole kidney, the attached adrenal gland, and fatty tissue that surrounds the kidney), sometimes with lymph node removal, offers the patient the best chance for cure. The procedure is the treatment of choice for localized cancer or in patients with tumor extension into the renal vein and vena cava. Surgical intervention is not curative for disseminated disease. Because of the proximity of the kidney to the diaphragm, the surgeon may explore the pleura on the surgical side. The patient could therefore return from surgery with a chest tube placed to remove blood and air from the pleural space. A partial nephrectomy is reserved for those patients with very small renal cell tumors, those who have cancer in both kidneys, or those who only have one kidney. Nephrectomies involve large blood vessels and place the patient at risk for postoperative hemorrhage. Frequent assessment and serial vital signs to monitor for shock are part of postoperative management. Patients undergoing a nephrectomy experience moderate to severe pain; for this reason, the anesthesiologist may place an epidural catheter during surgery for pain management with morphine sulfate or other appropriate analgesia. Monitor the patient’s urinary output through the Foley catheter for adequate volume and color and consistency of urine; if the patient’s urine output decreases below 40 mL per hour, notify the physician. Depending on the final stage of the kidney cancer, the surgeon may refer the patient to an oncologist for follow-up care. Kidney cancer is resistant to radiation therapy, which is used in high doses only when metastases have occurred into areas such as the perinephric region and the lymph nodes. Chemotherapy and hormonal therapy do not affect tumor growth. Although several experimental or alternative medications are being tested, they usually have many side effects or are of limited usefulness. Cytokines, proteins that activate the immune system, are currently being investigated as an approach to treat renal cell cancer by boosting the immune system to destroy cancer cells. Also being investigated are “targeted therapies,” which include antiangiogenesis drugs, which kill cancer cells by cutting off their blood supply. New research on treatment of kidney cancer has shown that kidney-sparing treatment may prolong life. Treatment with partial nephrectomy and cryoablative therapies with laparoscopic technique are now being used when the tumor is small and contained. Two of the most important postoperative priorities are to enhance gas exchange and to maintain the patient’s comfort. Institute pulmonary care on a routine basis. Patients with a smoking history may take longer to recover normal lung function after surgery. Encourage the patient to turn, cough, and breathe deeply at least every 2 hours. Show the patient how to use diaphragmatic breathing techniques and how to splint the incision. Teach the patient how to use an incentive spirometer to improve gas exchange. Ask the patient to describe the degree of pain on a scale of 1 to 10. Instruct the patient on nonpharmacologic methods for pain relief. If the patient is receiving analgesia that is insufficient to relieve the pain, notify the physician. Patients and their significant others are dealing with stressors that cause extreme anxiety and fear. Spend time each day discussing their concerns, being honest about the patient’s chances for recovery. If the patient experiences an unusual degree of spiritual distress, refer to a chaplain or clinical nurse specialist. The diagnosis of kidney cancer is life-threatening, and the patient may need to work through the issues associated with a serious disease. Larsson, S.C., & Wolk, A. (2011). Diabetes mellitus and incidence of kidney cancer: A meta-analysis of cohort studies. Diabetologia, 54(5), 1013–1018. A meta-analysis of nine cohort studies, which included 5,769,987 participants, revealed an increased risk of kidney cancer of 1.42 times among individuals with diabetes compared to those without (95% CI, 1.06 to 1.91). In this sample, women with diabetes were 1.7 times more likely than women without diabetes to develop kidney cancer (95% CI, 1.47 to 1.97), and cigarette smoking increased the risk by 1.29 times (95% CI, 1.05 to 1.58). Be sure the patient understands what medications are to be taken at home, their effects, and dosages. Explain follow-up information, such as when the physician would like to see the patient. Provide a phone number and written discharge information and arrange for a home visit from nurses if appropriate. Refer the patient and family to hospital and community services such as support groups and the American Cancer Society. Reinforce any postoperative restrictions. Explain when normal activity can be resumed. Make sure the patient understands the need to have ongoing monitoring of the disease. Annual chest x-rays and routine IVPs are recommended to check for other tumors. Emphasize lifestyle choices that can aid in recovery: quit smoking; limit alcohol to one to two drinks per day; eat more fruits, vegetables, and whole grains and less animal fat; and exercise once the patient is able. Q. Does anyone have any experience with kidney cancer? Any information would be appreciated. i'm sure you will find it helpful! Exposure The study by the US National Cancer Institute included 1097 patients with kidney cancer and 1476 people without cancer in central and eastern Europe. I went into this film wanting to be completely open and honest about living with kidney cancer and the huge advan-tagethat drugs are now making. The survey was advertised through the Kidney Cancer Canada and the Kidney Foundation of Canada websites and newsletters in both official languages and through social media channels. Data, personal statements, public opinion and various negotiations seem to have won the day and we could not be happier at this outcome for kidney cancer patients. He said: "I'm so happy that this treatment option is now available for other people suffering with advanced kidney cancer. And in the North East alone, kidney cancer rates have increased by 27% over the last 10 years. No screening tests have been shown to improve kidney cancer survival. Visit the Kidney Cancer Drugs Market - Global Drug Types (Brand) and Clinical Pipeline Analysis and Forecast 2013-2020 report http://www. The report provides comprehensive information on the therapeutics under development for Kidney Cancer (Renal Cell Cancer), complete with analysis by stage of development, drug target, mechanism of action (MoA), route of administration (RoA) and molecule type. ONE third of kidney cancer patients are still alive at year five using the drug nivolumab, it was revealed yesterday. A BLADDER and kidney cancer awareness roadshow is dropping in on Middlesbrough.